Best Beginning Preschool is a fun, nurturing and supportive preschool that draws curriculum from the best practices of Montessori, Reggio Emilia, multiple intelligence theories and nature education. We have divided our outdoor classroom into areas that allow children to play, build, climb, dance, create art and music, and explore the outdoors. Best Beginning believes that every child should experience time to learn and play outside. Our outdoor classroom gives our students appreciation for the outdoors during this age of digital entertainment. 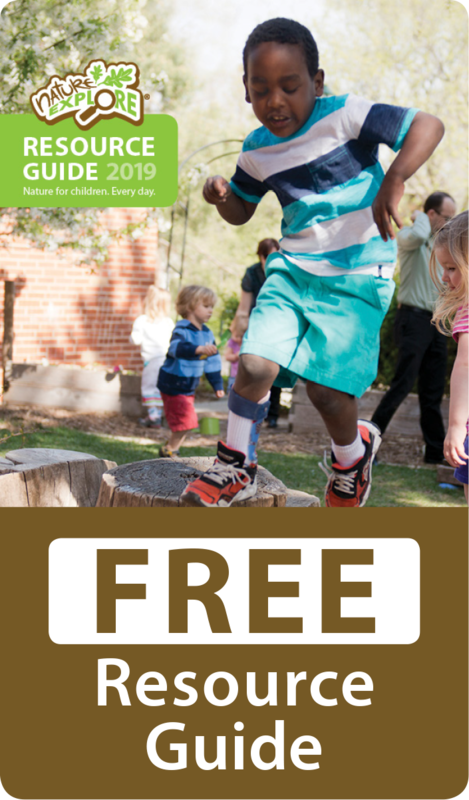 Over the past several years, the outdoor space has been transformed into a place where children can discover the wonder of nature while playing and having fun. The entry to the outdoor classroom is marked by a wooden gate and hand painted sign donated by a retired teacher, a chalkboard for announcements and a large plant. The entrance to the lower outdoor classroom is made clear with a beautiful wooden trellis, donated by one of our graduating classes. Each area is separated by ground logs and handmade wooden signs specifying the name of each space. The enclosed yard has many trees to provide shade, topics for study and a beautiful natural backdrop. Trees also provide a framework for the low ropes course and child sized zip line in the Climbing and Crawling area. In the Messy Play area, we have an outdoor kitchen where students use water, mud, sand and herbs to “cook” and get messy. We are also lucky to have a large motor boat shaped sandbox with seats, working buttons, a CB radio and a steering wheel. This provides hours of pretend play for our student body. The money to build the boat sandbox was donated by a different graduating class and one of our student’s father built the boat from scratch. This boat, and the pretend play that evolves, is reflective of our Chesapeake Bay region. 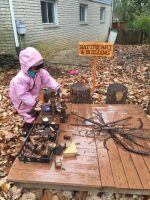 Next to the Messy Play, is the Nature Art and Building areas, which are low wooden tables with tree stumps for stools. Our students create projects such as fairy towers, cities, letters from sea glass and abstract designs in old frames. Children also enjoy building with tree cookies, pine cones, sea shells and stones. 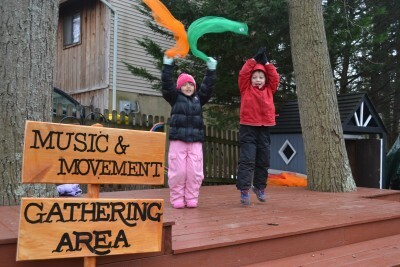 In the upper outdoor classroom is our Garden area, Gathering area and Music/Movement area. In addition to our vegetable and herb garden, we have a separate flower garden where the children can plant and care for flowers. An important part of our day is our afternoon meeting which is held outside on the stage. Parents can sit on our wooden benches to watch their children perform on stage during special days such as Mother’s Day. During a regular school day, children dance and sing to the music that other children are playing on the drums, cymbals, and shakers. We are actively fundraising to purchase an outdoor xylophone to enhance our Music and Movement area. Next to the stage, the playhouse is a great space for pretend play. In the future, we would like to replace the house with a teepee and add a “Make your Own” shelter area. The large driveway, that separates the upper and lower areas, is the Wheeled Toy area. This provides the perfect place for riding tricycles, toy cars and playing with large toy trucks. The children also enjoy drawing with sidewalk chalk here. To provide parents with a glimpse of our day, we post Facebook photos of students enjoying our outdoor space. We would like to thank all those who participated in our fundraisers, donated materials and helped to build the elements that make up our outdoor space. We could not have created this place for the children to grow if it had not been for the moms, dads, grandparents and other community friends who donated their time and money towards this outdoor classroom.